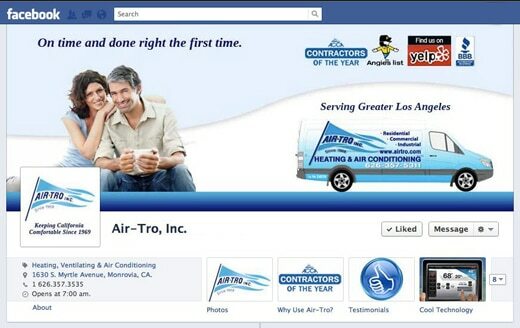 Two years ago, heating and air conditioning company Air-Tro decided to take the social media plunge. The owner, Robert Helbing wasn’t entirely convinced that people would be interested in connecting with a heating and air conditioning company. After all, we only think about heating and air is when it isn’t working, right? However, he was willing to give it a try and has been very happy with the results: Increased traffic to the website and increased business despite an economic decline. 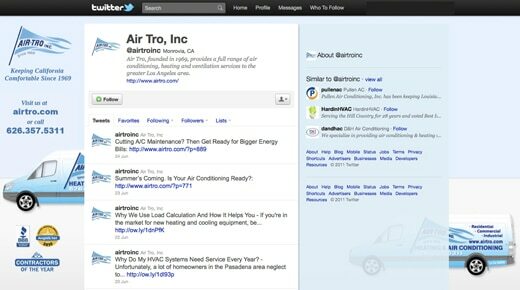 Prior to using social media, most of Air-Tro’s new business came via word-of-mouth. Social media gives you the opportunity to accelerate that word-of-mouth. As long as you are increasing your fans’ and followers’ awareness of your company and the value you provide (and not hitting them over the head with promotion) they will tweet, like, comment, and/or review your brand, which is essentially spreading the word to others. The better you get at this the more people you can reach. If you think about it, social media is much like the public relations arm of a company. It’s function isn’t to get direct sales, you use it to get your name well-known and to get your products and services well-thought of through your good works. That creates interest and will generate leads. With all the positive testimonials Air-Tro has, social media was the perfect platform to get the word out and expand the company’s reach. “Dear Lisa, I was asked to write an article for a trade publication regarding having a presence on the internet. I could’ve saved myself a lot of time by just publishing ‘Hire Lisa at Buzz Accelerator’, but they wanted 500 words. 🙂 So this is what they published. First, the design and setup was done for Facebook, Twitter and YouTube. Next, a strategy was worked out for how to manage the pages. For twitter we autopost the blog posts and use special software to post a library of tweets such as special offers, press and awards, company information, services, faqs, testimonials, helpful hints and tips, and previous blog content based on season. Everything from facebook also gets tweeted to the twitter account for additional exposure. 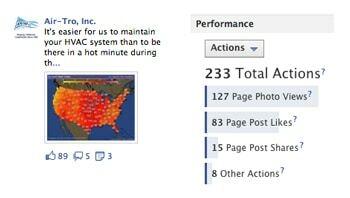 To get followers we started following everyone within a 25 mile radius of Monrovia, CA where the HVAC company is based. We also followed other HVAC companies, Chambers of Commerce and other local businesses in order to reach the right target market. There’s a lot of filtering to keep out kids, non-English accounts, and bots, but for the most part it’s been working to steadily build a twitter community. We respond to all mentions and do a lot of retweeting of content related to the heating and air conditioning industry (energy savings, air quality, etc.). For Facebook there is a lot more attention given to what content is getting engagement and what is not. Over time you learn what people respond to and it is always surprising to see. For example, who would have ever guessed that dogs and cats in front of fans and heaters would be such a big hit and be so share-able? On Facebook you just go with it. 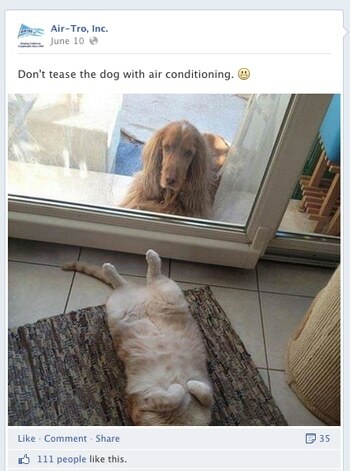 We end up posting a lot of funny pictures with dogs and cats as long as it relates to being hot or cold. Yes, it seems silly, but it works to get exposure for the brand. When a post is really good we’ll use it as an ad to exponentially increase the reach. This ad, based on the successful post, is getting a whopping 16.301% click through rate, when the average is about .04-.05%. It was targeted to 150,000 people ages 28 and up living within 25 miles of Pasadena (next to Monrovia) who owned a home. Will all the page “likers” become customers? 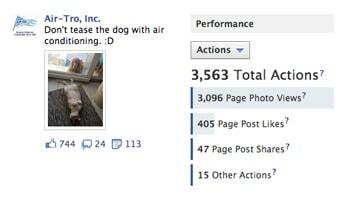 No, but once someone has ‘liked’ the page, the Air-Tro brand is now in front of them in case they ever do have a need for heating and air conditioning services. The bonus for running this ad is that it is only costing the company .04 per engagement. And no, that wasn’t a typo. Of course we are not posting only silly images. The facebook page is chock-full of energy tips, air and heating education, diy projects, community news, and special promotions. And those posts get ‘likes’ too. Another successful post turned into an ad is this one. It highlights the importance of getting your system checked before you have a problem. Finding visually appealing images helps to attract your viewer’s attention and make a stronger point with the supporting message. 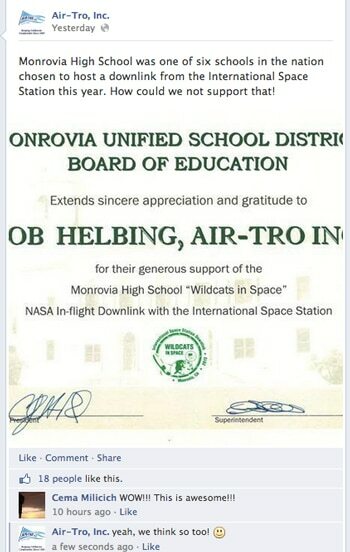 We also discovered that Facebook fans respond well to good deeds done such as the various community activities that Air-Tro participates in like this one from Monrovia High School. What may seem like bragging on a website can totally work on social media. It’s actually good Public Relations. You become more “real” to people because you are acting like a person, not a company. People respond to that and that’s how you connect with them. Do you need help with your social media management? Find out if we can help you too.